The India Initiative's 2016-2017 Annual Report highlights its major events and programs from the 2016-2017 academic year. 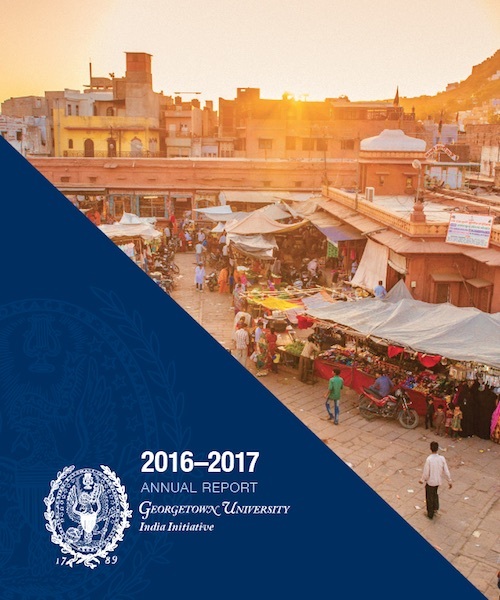 The 2016-2017 academic year was a year of growth for the Georgetown University India Initiative. We hosted more than 30 events; awarded five collaborative research seed grants for Georgetown faculty to work on shared projects with their Indian colleagues; launched the India Innovation Studio; and welcomed Ambassador Richard R. Verma, outgoing U.S. ambassador to India, to Georgetown as an SFS Centennial Fellow and advisor to the India Initiative. We continued our mission to convene high-level conversations between U.S. and Indian thought leaders in business, government, civil society, and the academy this year. In September, we hosted a two-day foreign policy workshop for a delegation of Indian members of parliament visiting Washington as part of the FICCI Indo-U.S. Forum of Parliamentarians. We also continued the India Initiative Distinguished Fellows Program, hosting prominent journalists and media personalities Rajdeep Sardesai and Sagarika Ghose for a one-week fellowship in October. We concluded the academic year with our inaugural India Ideas Conference, which brought policymakers and practitioners from the United States and India to campus for a day of plenary talks, keynote lectures, and breakout sessions about India's contemporary challenges. The India Initiative also works to strengthen Georgetown’s research and teaching on India and its role in world affairs. In addition to awarding faculty with research seed grants, we also launched the India Innovation Studio, a multidisciplinary, studio-based course that works with governmental and civil society partners in Maharashtra and focuses on designing policy solutions to a development problem facing India. Through this course, 20 undergraduate students had the opportunity to travel to Mumbai in June 2017 and discuss drought solutions with Chief Minister of Maharashtra Devendra Fadnavis. The Georgetown University India Initiative delivered on its promise to bring India to Georgetown by hosting high-level bilateral conversations and introducing students to the best and brightest thought leaders from government, business, civil society, and the academy. In 2017-2018, with your help and support, we look forward to building on this momentum so that we can continue creating a leading program in Washington, D.C. that advances the study of India and meaningfully supports academic and cultural diplomacy between the world’s oldest and largest democracies.